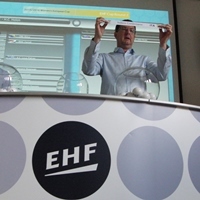 DHK Banik Most from the Czech Republic, H 65 Höör and Union Mios Biganos Begles have two things in common after the draw at the EHF Office in Vienna has determined all pairings for the first two playing rounds in the Women's EHF Cup. They won the last three editions of the Challenge Cup and they all will face tough challenges in the early stage of the competition this season. The 2013 Challenge Cup winners from Most might be considered favourites against Italy's Cassano Magnano in the Round 2, but if they live up to the expectations and proceed to the Round 3, they will face Dinamo-Sinara, the 2008 EHF Cup Winners and the participants of the last MVM EHF FINAL4. Höör, who won the Challenge Cup one year later, are to lock horns with a French team Nantes Loire Atlantique HB, while the current Challenge Cup holders Union will meet Norwegian side Tertnes Bergen. As Holstebro are playing in the Cup Winners' Cup in the 2015/16 season there will be a vaccant throne in the EHF Cup. In total there are 15 national champions and taking part in Round 2 and Round 3 and three former winners (1998 Dunaujvarosi KKA, 2008 Dinamo-Sinara, 2010 Randers HK) will also be back in action. Dunaujvaros, who can also boast the EHF Champions League trophy from 1999, will play against the winner of the Round 2 match between Israeli champions HC Holon and Italian title holders Indeco Conversano. Randers will start their campaign in the Round 3 against the winners of the Round 2 Benelux derby encounter between HC Femina Vise from Belgium and the Dutch club Succes Schoonmak VOC Amsterdam. In last nine years only one club (Itxako Navarra) could break the combined Russian-Danish hegemony in the EHF Cup as only teams from these two countries were taking trophies in turns.